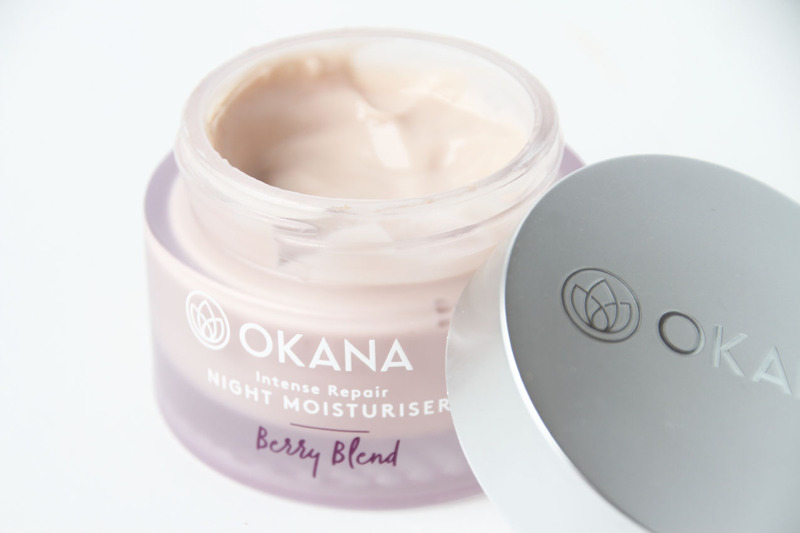 I'm back and have been testing out a new 100% natural New Zealand made skincare brand - OKANA. It arrived on my doorstep a few weeks ago and I've been pleasantly surprised ever since! With so many skincare products on the market that claim to be 'natural' but still have questionable ingredients, it's hard to know what's really in them! 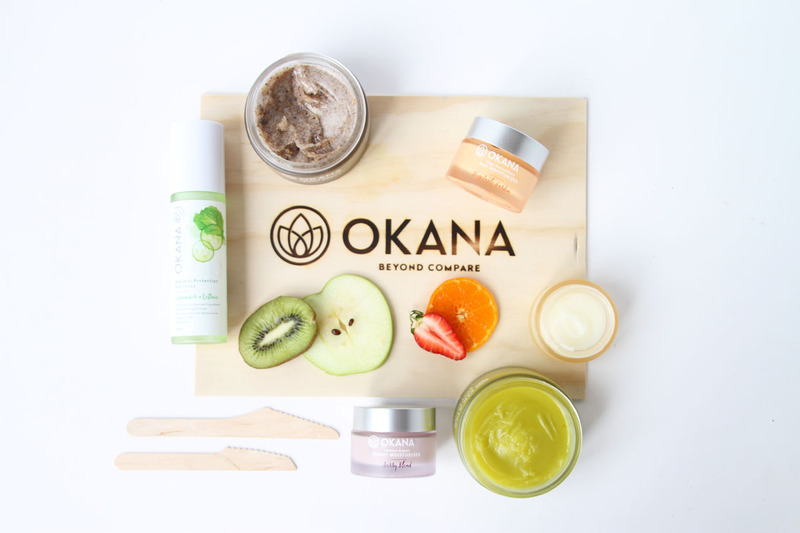 What's special about Okana Skin Care is that all their products contain between 4 and 7 all-natural ingredients that are all fresh and minimally processed. They are so natural that none of the products have thickeners, stabilisers, fragrances or synthetic preservatives. 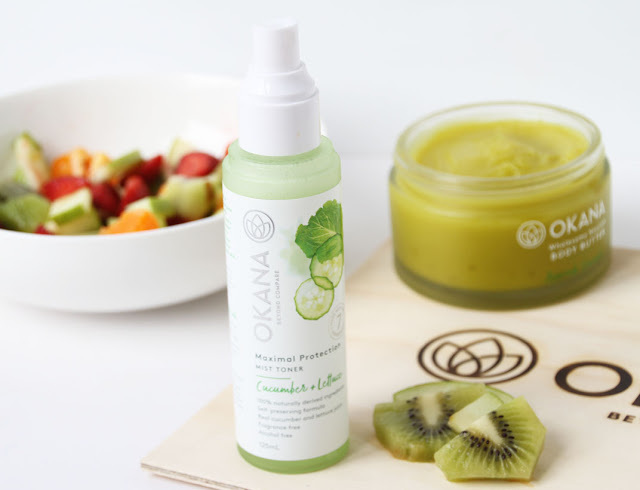 Okana's promise is that if you won't put it in your mouth, they won't put it in their products. 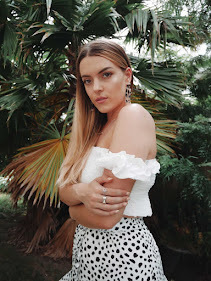 My skin type is quite dry and sensitive, so a big plus for me is that their products are also fragrance and alcohol-free leaving my skin irritation free! 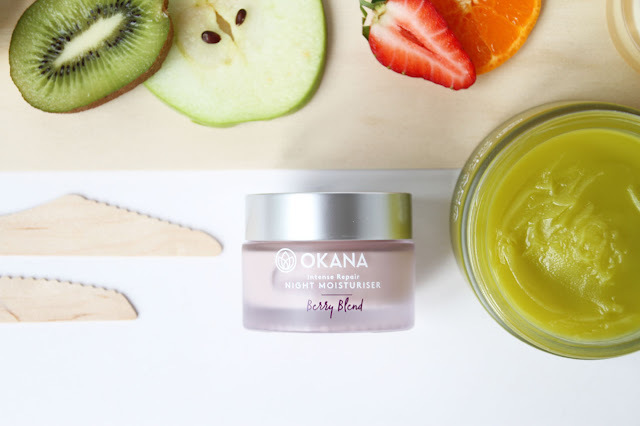 I picked out two favourites from the range the Berry Blend Night Moisturiser and the Cucumber & Lettuce Juice Toner! It might look like the berry yoghurt you have for breakfast but this purple pot of goodness is a rich hydrating facial cream packed with nutrients. Said to help restore your complexion while you sleep! Just before bedtime, I've been applying this moisturiser to my face and neck, it instantly absorbed into my skin in just under a minute leaving my skin feeling very soft and hydrated! I'm not one to usually use a night cream but I've included it into my daily skincare routine and so far so good! As I mentioned I have very dry skin and a hydration boost is just what my skin has needed! Key ingredients such as the mixed berries are well-known for their health benefits with vitamins A and C, along with macadamia nut and apricot kernel oil, make this cream super hydrating. Made with only 7 ingredients! You can use this mist to tone, refresh, and set your makeup. The Cucumber & Lettuce Juice Toner is said to help even skin tone and neutralise your pH balance. I found this toner so refreshing, especially with Summer around the corner this will be in my handbag 24/7. I've always said a good mist/ setting spray/facial spray whatever you want to call it, is a product everyone should have in their daily skin care routine! It is so important to keep your skin hydrated, after all, it is the most important organ to protect as it protects you! The two key ingredients as the name suggests - Cucumber and Lettuce have so many skin benefits. Lettuce juice is full of nutrients, minerals and vitamins. Rich in vitamin A which revitalises the skin by stimulating the growth of new healthy skin cells. Paired with the cucumber juice, helps increase the production of your skin's collagen reducing photo-ageing it also contains vitamins C, B1, E and K for hydration! This toner is suitable for all skin types, including those with sensitive skin.